In Between Two Cities, you are a world-renowned city planner who has been asked to redesign two different cities. Projects of such significance require the expertise of more than one person, so for each assignment you are paired with a partner with whom to discuss and execute your grandiose plans. Each turn features a simultaneous discussion with your two partners to decide which of your tiles to place into the cities you’re building with each of them and where in those cities to place the tiles. At the end of the game, there is only one winner, as each player compares the lowest scoring of their two cities. 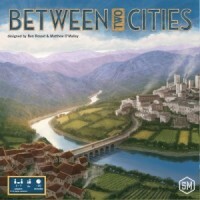 Between Two Cities is a tile-drafting game in which each tile is part of a city. You work with the player on your left to build one city center while simultaneously working with the player on your right to build a second city center. On each turn you select two tiles from your hand, reveal them, then work with your partners to place one of your selected tiles in each of your two cities. 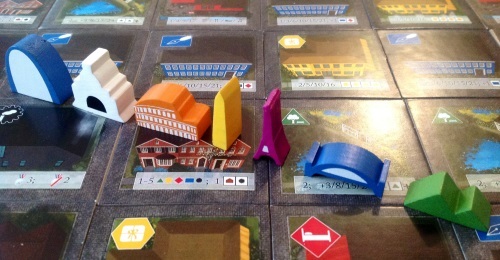 At the end of the game, each city is scored for its architectural grandiosity. Your final score is the lower of the scores of the two cities you helped design, and the player with the highest final score wins the game. To win, you have to share your attention and your devotion equally Between Two Cities. The base game is intended for 3-7 players. Variants for two-player and solo play are included. 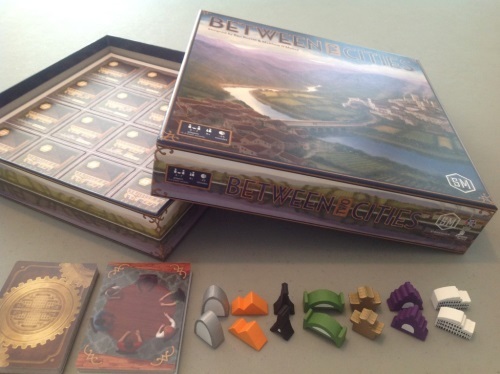 Add a Review for "Between Two Cities"